WASHINGTON - Taiwan's main opposition leader and potential "presidential" front-runner vowed on Wednesday to uphold the status quo with the mainland, rejecting both independence and early unification with the mainland. 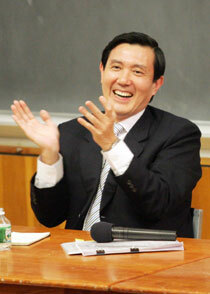 Ma Ying-jeou, chairman of the Nationalist Party and mayor of Taipei, said if his party wins the 2008 election, he would reopen talks with the mainland on mutually accepted terms. "We will not pursue Taiwan's de jure independence, nor will we pursue the policy of immediate unification," Ma told Reuters Television in an interview in Washington. "This is a policy that really fits the needs of the United States, mainland and the Taiwanese people," said the 55-year-old Ma, seen by many as the opposition's best bet for victory in the 2008 polls. Taiwan's relations with the mainland have been strained since February when pro-independence "president" Chen Shui-bian scrapped the National Unification Council, a dormant but politically significant body aimed at one day reuniting Taiwan and the mainland. Ma's Nationalist Party, also known as the Kuomintang, favors closer ties with the mainland and has criticized Chen's move. In a speech at the American Enterprise Institute in Washington, Ma vowed to resume talks that have been frozen since before the election in 2000 of Chen, whose Democratic Progressive Party champions an independent Taiwan identity. "If the Kuomintang is able to come back to power in 2008, we certainly will resume the interrupted negotiations based on the 1992 consensus, namely one China, different interpretations, this has been accepted by the mainland," Ma said, referring to a formula agreed 14 years ago in Singapore. The United States recognizes the one-China policy, but in a deliberately ambiguous piece of foreign policy it is also obliged by law to help Taiwan defend itself. U.S. President George W. Bush has offered what would be the biggest arms sales to Taiwan in more than a decade. But the Nationalist-led opposition, which controls a slim majority in "parliament", has repeatedly blocked the deal. "We support reasonable purchase of arms from the United States, we need adequate defense capability (and) we want to demonstrate our determination to defend ourselves," he said. The Nationalists once ruled all of China and fled to Taiwan after losing the Chinese civil war in 1949. The party enjoyed uninterrupted rule of the island until 2000, when it lost to Chen's party. Beijing is preparing for all eventualities as Taiwan leader Chen Shui-bian has intensified his secessionist push for the island's "de jure independence," Premier Wen Jiabao said on March 14 at a press conference in Beijing. He accused Chen of seriously damaging cross-Straits peace and stability with his February 27 decision to scrap a government body that sought eventual unification with the mainland. Chen's actions are "highly risky, dangerous and deceptive," Wen told a press conference following the end of the annual session of the National People's Congress (NPC), China's top legislature. "We should guard against the escalated secessionist moves to push forward the 'constitutional re-engineering' project aimed at 'de jure independence'," the premier said. "We are keeping a close watch on the development and preparing to deal with any possible consequences." He said the mainland "will never waver in its opposition to secessionist activities and will by no means allow Taiwan to secede from the motherland." Wen also offered to hold talks with Chen's ruling Democratic Progressive Party as long as it drops its pro-independence platform. The premier reiterated that Beijing is willing to talk to any individual or political party from the island under the one-China principle, which maintains that both Taiwan and the mainland belong to one and the same China.